UPDATED: Thomas Nilsen, editor of the highly acclaimed Independent Barents Observer in Kirkenes, seems to have become the latest symbol of tensions between Norway and Russia. Calls are now going out for the Norwegian foreign ministry to demand an explanation from the Russian Embassy in Oslo, as to why Nilsen was stopped at the Russian border on Wednesday while traveling into the country with a delegation from the Danish Parliament’s foreign affairs committee. Nilsen says he was told he’d been “declared unwanted” by the Russian federal security service FSB. He’s been banned from entering Russia for the next five years. “I expect (Foreign Minister) Børge Brende to call the Russian ambassador in on the carpet, to clarify why Thomas Nilsen is a threat,” Nils Bøhmer of the environmental organization Bellona, told Norwegian Broadcasting (NRK) on Friday. Bellona has had plenty of skirmishes with Russian authorities itself over the years but claimed it was “quite special” that Russia now has resorted to declaring that Nilsen is a threat to its national security. “There must be something behind this,” Bøhmer told NRK. Nilsen is among the pioneering journalists in Kirkenes who have been covering Arctic issues and relations with Russia for years. He was given no reason for his sudden ban on entry. All Norwegian and Russian residents who, like Nilsen, live within 30 kilometers of the border at Storskogen are supposed to be allowed to travel over it freely. See the Independent Barents Observer’s own account of the ban on Nilsen here (external link). Nilsen also pointed to the “paradox” of how Moscow otherwise has promoted the Northern Areas and the Arctic as an area for dialogue. Nilsen suspects Russian officials don’t like how the Independent Barents Observer publishes its articles in both English and Russian, using a server that is not in Russia. The newssite relaunched its Russian edition just last fall (external link to The Independent Barents Observer) with support from Norway’s foreign ministry. Bøhmer of Bellona noted that The Independent Barents Observer, a small operation run by Nilsen and his journalist-business partner Atle Staalesen, has covered important issues in the Norwegian-Russian border area including many related to the environment, “and filled an information vacuum that few others can.” The news service has been lauded for its coverage of Russian activity in the Arctic, oil-drilling plans in the Barents Sea, industrial pollution and problems tied to nuclear power and nuclear waste. Norway’s foreign ministry has not yet specified how it will respond to Russia’s ban on Nilsen, but told NRK it regretted that a Norwegian journalist has been denied entry. EDITOR’s NOTE: Newsinenglish.no cooperates with The Independent Barents Observer through link and photo exchanges. 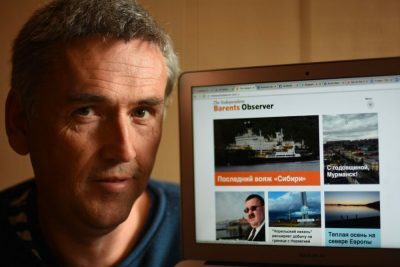 We carry a direct link to The Independent Barents Observer’s front page on all our pages, and encourage readers to follow its coverage of issues in the Arctic, Northern Norway and neighbouring Russia.